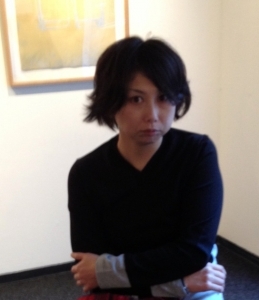 Yoko Hara is an exciting artist who received a Masters degree in painting from Musashino Art University, outside of Tokyo, where she studied with Takahiko Hayashi. Since school, she has chosen to paint and make original prints, combining techniques such as aquatint and drypoint. In these delicate intaglio prints the artist explores subtle themes that reveal an experienced and sophisticated eye. Yoko cites travels in Southeast Asia and a study year in Ireland as some of the inspirations for her unique nonrepresentational prints. Whether it is the warmth of color, or the choice of design, the viewer is immediately drawn to this work. The titles she gave early images occasionally were somewhat confusing. Instead of using a one or two word title, many had lengthy, enigmatic names incorporating lines of poetic verse or philosophical thoughts. One example is 'When counting sheep, it doesn't matter whether they are black or white. ' Such elliptical titles do not restrict the viewers appreciation. They can experience her work without being limited by the constraints of a more specific title. New work has focused on landscapes and inspirations from nature. The flower, tree and landscape inspirations reveal an inquisitive mind, approaching traditional subjects in new ways.